I believe one of the biggest reasons vegetarian and vegan cooking gets a bad name is because there are a ton of flavorless meals and recipes out there. I think it’s easier with a good cut of meat to just add a bit of salt/pepper then call it good and while I feel the same about vegetables (or just raw, by themselves), it’s not always easy to win over the meat eaters in my life (like my husband). It’s easier to assume that it must be bland because it’s vegetarian (not because I didn’t season it right). Seasoning in cooking is everything and that is especially true in vegetarian cooking. So with that said, your spice cabinet is your best friend (even if it’s unruly with jars everywhere that may date back to the 1990’s- hi mom!) It’s worth thinking of this every once in awhile, doing a bit of cleaning, and stocking up on fresh spices (because you can season with older spices, but your not doing much to tackle the bland factor). I love places that have bulk bins for spices because then you can get as little (or as much) as you want which means freshness in flavor. 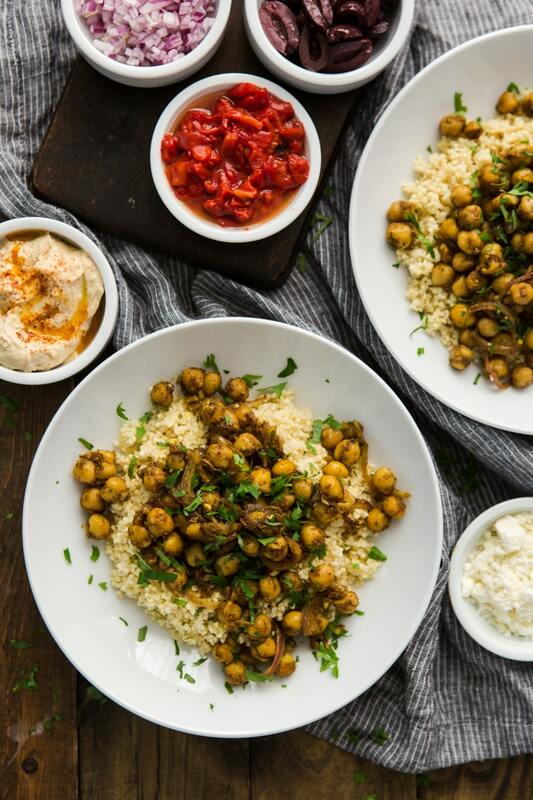 This chickpea shawarma recipe may seem like it takes more ingredients then it’s worth but if you have a solid spice cabinet (and pantry), it comes together with ease. All of these spices are ones I keep around for every day cooking. Add in chickpeas and millet (which are also always in my cupboard) and you’ve got yourself a meal that’s hearty and packed with flavor. You can also cater the toppings to whatever you like (leave the feta off for vegan, ditch the hummus for yogurt, etc). On a separate spring-cleaning note, if you subscribe by email to the site (or are thinking about starting), I’ve created two new options to help keep your inbox clutter down. You can now subscribe to a weekly digest or even a monthly digest where all new recipes will arrive packaged in one simple email (that is nice to Outlook- problem fixed)! In a medium bowl, combine minced garlic with spices (cumin through the cayenne pepper). Add in the olive oil and stir until well combined/paste has formed. Stir in the chickpeas and red onions, using a spatula to toss and coat. 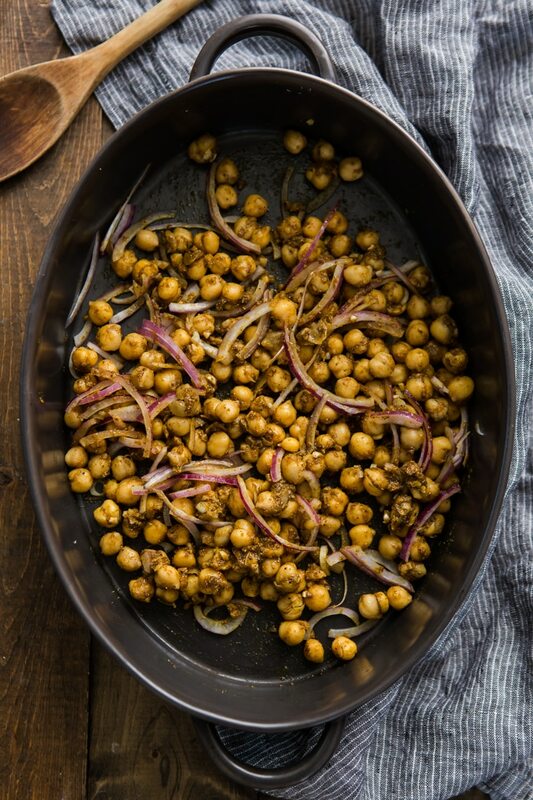 Transfer chickpeas to a roasting pan and cover with foil. Bake for 30 minutes until chickpeas are hot and onions are tender. While chickpeas are cooking, combine millet with 2 cups water and a pinch of salt (see note). Bring to a boil, reduce to a simmer, and let cook until the majority of water as been absorbed (12 to 14 minutes). Cover, remove from heat, and let sit until chickpeas are done (the millet needs a bit of time to absorb any leftover water). 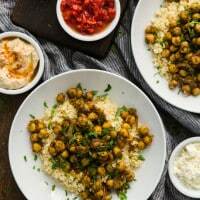 Prepare the toppings you want to use and once chickpeas are done, divide millet, cover with chickpeas, and add your favorite toppings. *I’ve also used whole spices before. I usually just a touch less of the whole spices and allow them to toast a bit in a dry skillet before grinding. *Millet can also be toasted before hand. Simply add the millet to the dry pot and over medium-low heat, cook the millet, shaking the pan often, until the millet is fragrant, 5 to 6 minutes. *These toppings are just a suggestion- tomatoes, cucumbers, and yogurt sauce make nice additions. Does that make my pantry extra unruly if I have jars dating back to 1987?! This looks so flavorful and easy to make. I’ve never cooked millet before, have always eaten it raw, so looking forward to trying this out very soon. I’m curious how you normally eat it raw? I’ve never tried that before! Yum! 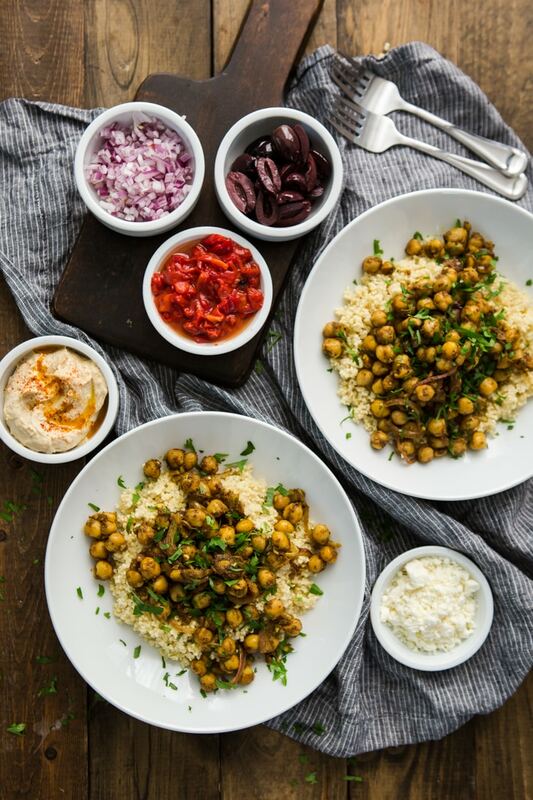 What a cool idea turning chickpeas into schawarma! This sounds incredible. Got a good chuckle on the mid 1990’s spice shelf….Some of them are actually like concrete mix, and you need a knife just to separate and thin them……. They still have flavor….. This is a recipe after my own heart! Love the spices in this recipe, many of which I use on a daily basis! This sounds amazing! I’m a big fan of all the flavours that you’ve used here and this looks like the kind of food that could convince even the most carnivorous of carnivores to embrace vegetarian eating! This looks wonderful! An absolute must make for my family! 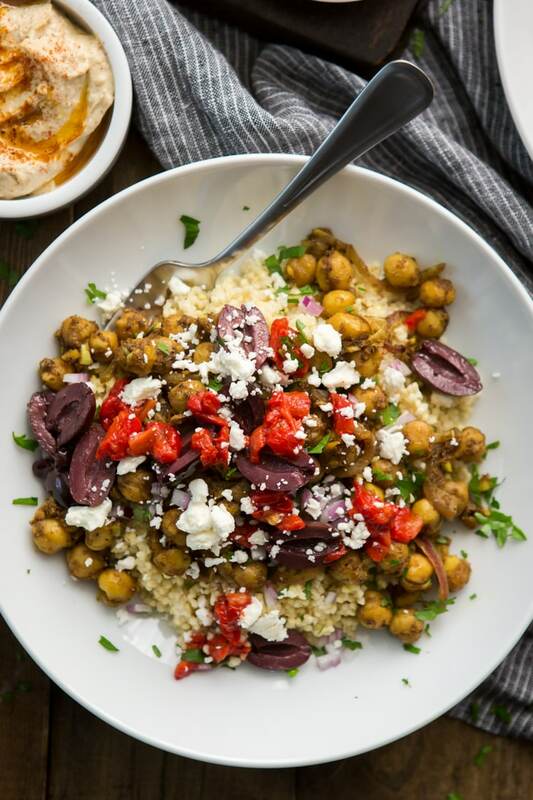 You had me at Kalamata Olives & chickpeas! One of my favorite flavor combo!!! After living in the Middle East when I was a kid, nothing rocks my boat like a schwarma. NOTHING. I would pay uber money just to have a legit schwarma again. BUT I’ve really wanted to find/make a vegetarian version… so I am SOOO excited to have found your little slice of schwarma heaven. Cannot wait to try it. I hope it lives up to your expectations! Let me know what you think! This was the most delicious dinner I’ve made in a loooong time and I didn’t even put any toppings on! Never realised how lacking in flavour my regular dinners were!! I had it with coconut rice instead of millet…went back for seconds…and then some! Thank you so much! Such a tasty dish! I served it with tzatziki and 5 minute cous cous instead of millet and we devoured it. Can’t wait to make it again. Wow! The idea of making chickpea shawarma is just genius! That looks so yummy! I am definitely making this this week. Looks amazing. Your pics are beautiful as well! We made this last night with farro instead of millet. Amazing. Will be making again, for sure. Love, love, love your website! This looks amazing, and I can’t wait to try it out. As a vegan, I am always looking for delicious, high protein dishes. The chickpeas will be a great protein source. I have never tried millet before, so this recipe will help me venture away from my usual meals. I made this exactly like the recipe, it was really delicious! Sort of an Indian/Mediterranean combo that totally works!